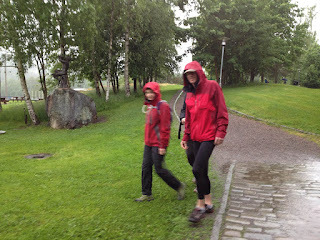 As we stood on the platform waiting for the metro to Sognsvann for Oslo Forest Marathon 2012, the heavens opened. Luckily I was wearing rain gear, but I shivered at the thought of taking off all my Gore Tex and running 42.195 km in this weather. This is so not what I signed up for! We arrived at the Norwegian College of Sports Science almost a hour before start, and fought our way to the start number pick up point past miserable marathoners huddled indoors, trying to keep dry and warm as long as they could. Past the stadium, the deep green hills of Nordmarka were uninviting and shrouded in fog. It looked like the start of a wet, cold day. 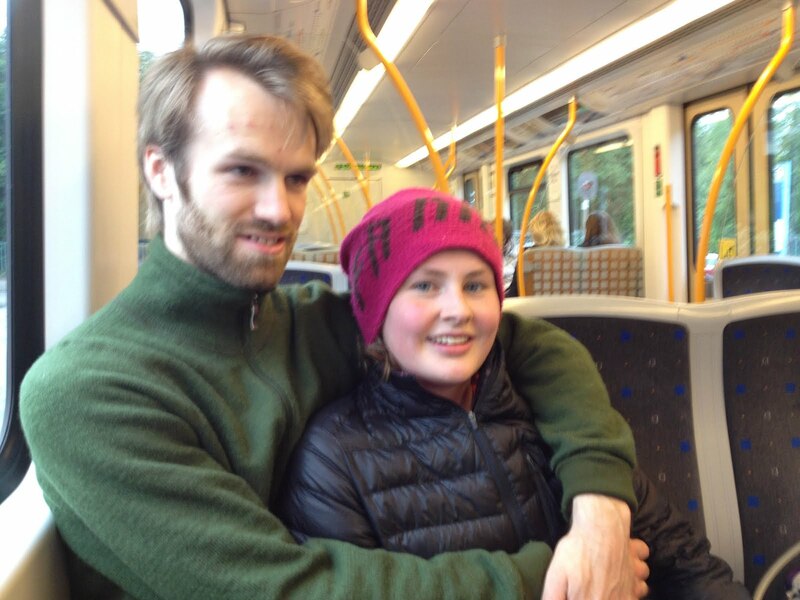 I put on a t-shirt over my long-sleeved polypropylene top, afraid of freezing for four hours. Miraculously, the weather gods appeared to have heard the prayers of 500+ marathoners. Fifteen minutes before start, a small patch of blue sky appeared and continued to grow - although gray clouds were still ominously visible in the distance. By the start at 11 o'clock we were in the sun. 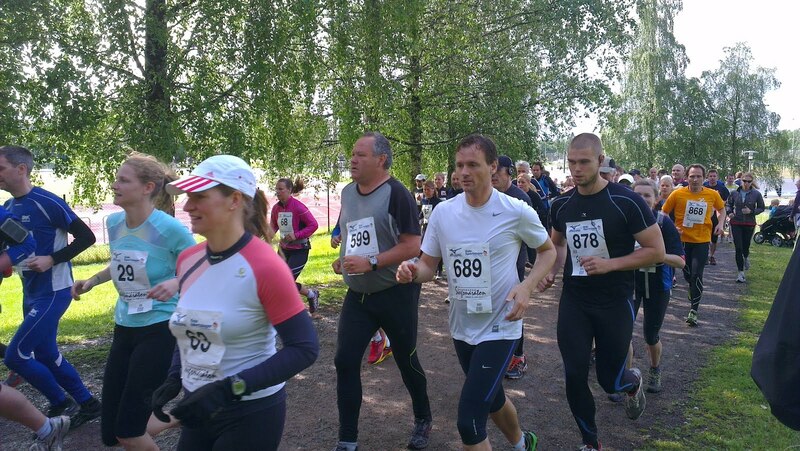 Upon the start signal, the runners chugged slowly of the stadium and towards lake Sognsvann. I had a weird, nervous feeling out not really knowing what I was setting out on - could I really do this? Heading out of the stadium: you can just barely see me in this picture behind racer 878. For a while, I really doubted that I could. 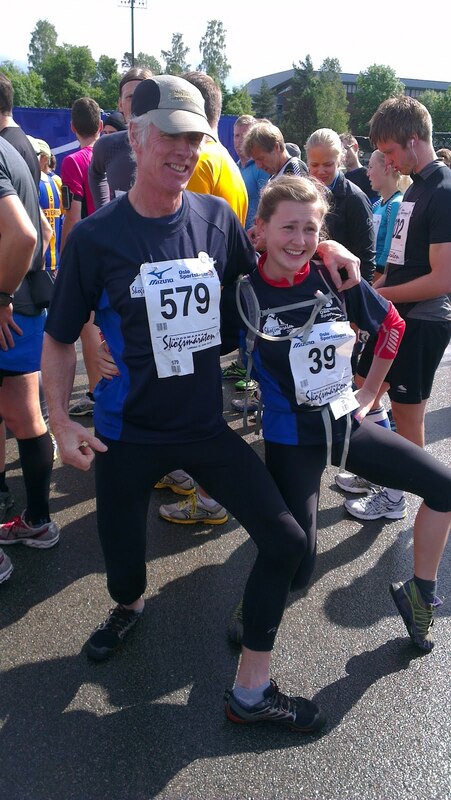 Dad and I had agreed to set an 11 km/h pace and run together for as long as possible. Fat chance, I realized 2 km in. I needed to go at my own speed and let my legs wake up before I had any chance of keeping that pace. I let Dad drop me and took a 30 second stop to take off my long-sleeved shirt and throw it into my tiny race backpack. I set out at a jog, trying not to look at the pace reading on my watch, focusing on my legs. I needed to be comfortable running if I had any chance at finishing. As I reached the 6 km sign, my legs suddenly became light and agile. 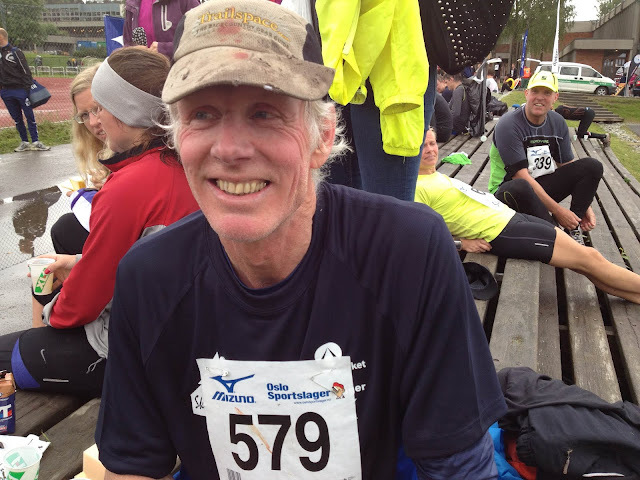 I picked up the pace around lake Skjersjøen, for the first time in the race really enjoying running. Many people were running with headphones. I often train with music, but when race time comes around I really like to go without. I like to be completely present, to really get a chance to feel the race. When I'm feeling good I can think about the scenery or the feeling of my legs racing beneath me. When I'm more tired I need to be entertained. To entertain myself sometimes I 'play' songs in my head, sometimes I calculate the distance to the finish in fractions and then percent, and sometimes I narrate myself running. Time passes rather unevenly, but somehow I get there. On the downhill towards a few km from Bjørnholt, my legs started to complain, and as it flattened out people started passing me. Finally the only person I could see was an older woman in a pink Oslo Marathon 2010 t-shirt (which I also have, as this was my first marathon). I speed up to close the gap between us, and latched on to her like a leech. I followed her steady tempo out to the turning point, high-fiving dad running down the road in the opposite direction as me. He was about 1 km ahead of me at this point, still looking strong. At the turning point, I felt relief. This was the furthest point out; everything from here on out was working my way back to start (albeit by a different route - se map below). For the first time I actually believed I could finish. The Oslo Forest Marathon route, as tracked on my cell phone GPS. A few minutes after the turning point, 2:02 hours from start, me and my silent pink-shirted pacer hit the half marathon point. 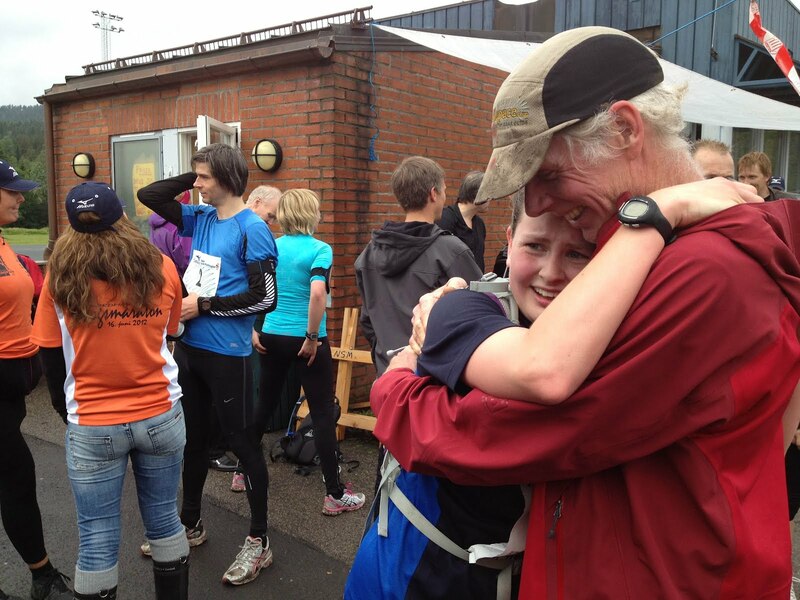 Again I felt elated; although I only half way, every step I took meant I had less left to run than I already had run. It started to rain again. I was getting tired by now, so I can't remember how hard it was raining, just that I felt wet and was on the dangerously on verge of becoming cold. I focused on the woman in pink ahead of me keeping a perfect 11 km/h pace on terrain where I would likely leapfrog. Every time my brain said I'm tired I would take a sip of the foul sugary concoction in my water bladder. More sugar for you. Past the dam at Fyllingen, I hit what I shall now refer to as the Hill of Death. Decisively flat-looking, this hill lasted for 3 km and reduced my pace to a fast walk/jog to avoid my legs seizing up completely. Luckily I biked the marathon route in May, so I knew that the Hill of Death was, in fact, not endless and that a lovely downhill was coming up, followed by a section of gnarly trail. These are two things I am good at, and I soon forgot the hill of death as I set down the even hill at 13 km/h, starting to pass people with less hardy knees than mine. On the trail section I really came into my own - leaping over puddles and across rocking sections, probably passing a good 10 people. As I reached the dirt road again, I passed the 30 km sign and realized it was 2 o'clock. Before the race, me and my boyfriend, Audun (fondly known as The Man Unit) agreed that he would start walking towards me at 2 o'clock at then pace me to the finish line. A few calculations comparing my speed to his (probable) walking speed lead me to an estimation that we would meet around 37-38 kilometers, and that thought was all-consuming for the next kilometers. Just run 6 more km and you can run with The Man Unit. Just run 4 more km and you'll meet The Man Unit. He's just around the next corner, just keep running. My calculations, luckily, were spot-on - we met between km 37 and 38. I immediately perked up, although I wasn't feeling very talkative. He informed by that he had seen a lot for people who looked like zombies, and that I, in comparison, looked positively perky. Looking good! Although my uphill legs were shot, reducing my speed to a crawl, on the downhills we could really make time. Most of the race that was left was now downhill, and we flew by probably 30 people. That felt good, although a few would inevitably catch up every time the trail flattened out. Finally lake Sognsvann was in sight, we were crossing the dam, running up a tiny, oh-so-painful hill - and I could see the finish line. I registered my parents somewhere there, but I couldn't really hear anything except the tingling in my legs. I sprinted as hard as I could, passing one poor man in blue 20 meters before the finish line and practically crashing into the man registering start numbers. I have no words for how I felt after finishing, but the following pictures summarize it pretty well. 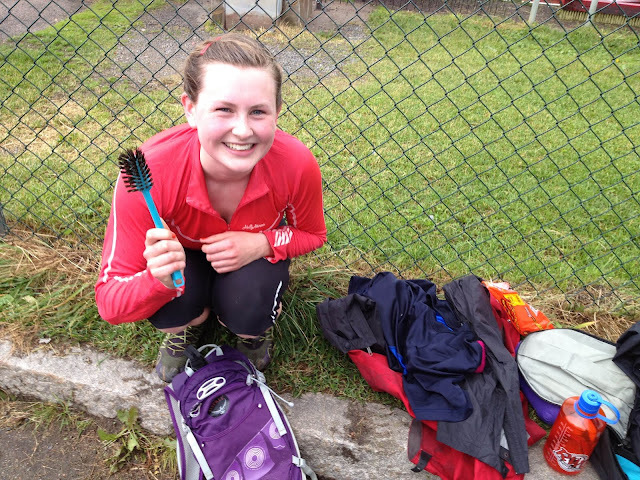 The I discovered I had run the whole race with the brush I use to wash my bike in my backpack. Opps! Down sweater on, completely exhausted on the subway towards home. Would I do it again? Yes, I would. That was fun! Except I can't walk today.